Castell Coch (Cadw) CastleWhile resting on ancient foundations, Castell Coch (Red Castle) is relatively modern, the by-product of a vivid Victorian imagination, assisted by untold wealth. The Middle Ages fascinated the Victorians as much as the Victorians fascinate us today. High Gothic was the order of the day. 1 November 2018 - 5 January 2020 Monday to Saturday 10.00am - 4.00pm, Sunday 11.00am - 4.00pm. 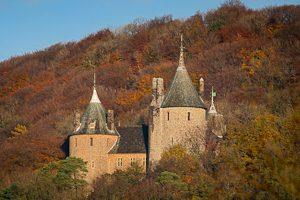 Closed 24, 25, 26 Dec & 1 Jan.
M4 Junction 32 & A470 north towards Merthyr Tydfil; follow signs for the Castle.